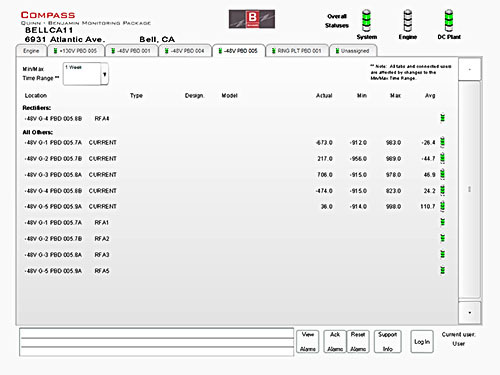 The power plant monitoring features are just another adaptation of the flexibility of the Compass Control System which, in this case, is called Compass Monitoring. It has been developed to be a comprehensive method to provide an aggregate vision into the various power systems that are typical to all telecommunications central office infrastructures. The hardware and software platform is scalable to integrate well into the smallest RSUs through the largest central switching centers. It combines the expandability to accommodate virtually unlimited growth for future expansion while providing visibility into existing legacy equipment – all on a common enterprise-visible platform. This system provides complete visibility, simultaneously, for both local operators and remote managers to precisely operate and effectively manage the resources that are necessary to provide voice and data services to our society and economy.